Deafening chants of "We want Bobby!" 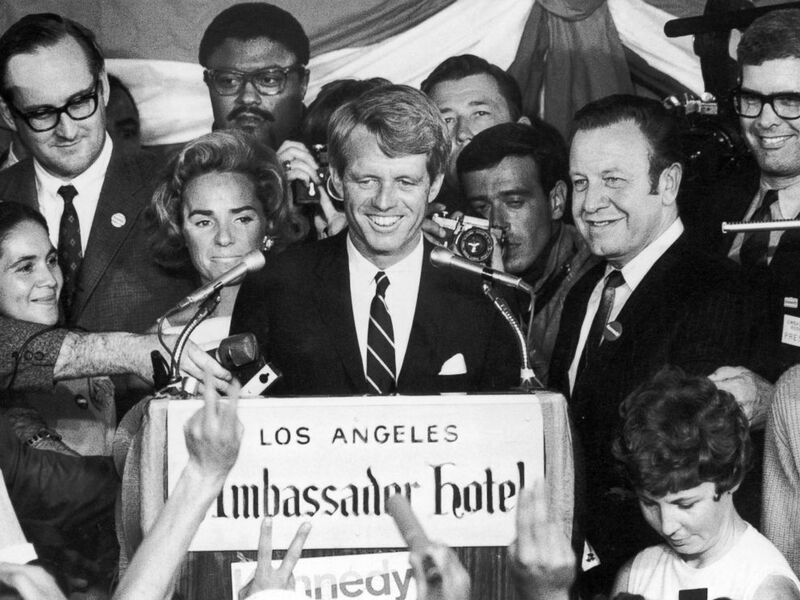 filled the stifling Embassy Room of the Ambassador Hotel in Los Angeles around midnight on June 5, 1968, as New York Sen. Robert Francis Kennedy weaved his way across a jam-packed stage. When he finally reached the microphones, they weren't working. "Can we get something that works?" the senator shouted to his aides in a Boston Brahmin accent that reminded many in the ballroom of his assassinated brother, the 35th president of the United States who challenged America to "choose to go to the moon." 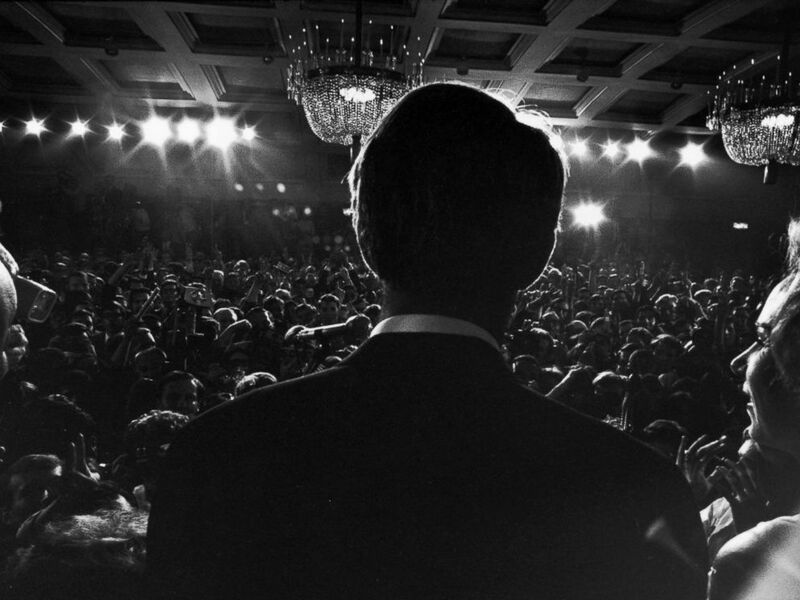 Rear view of Sen. Robert Kennedy and his pregnant wife Ethel standing at a podium at the Ambassador Hotel as he addresses supporters after his California primary election victory, Los Angeles, June 5, 1968. "I run because I am convinced that this country is on a perilous course and because I have such strong feelings about what must be done, and I feel that I'm obliged to do all I can," the 42-year-old Kennedy, who had served as U.S. Attorney General in his brother's administration, said as he pitched his hat into the ring for the nation's highest office. Five decades after Kennedy emerged as a beacon of hope to millions of young Americans disenchanted by a war half a world away and disintegrating race relations at home in the chaotic aftermath of Rev. Martin Luther King Jr.'s assassination, many questions about his death remain unanswered. His eldest son and namesake now says he firmly believes his father's real killer eluded arrest and the case needs to be reinvestigated. Sen. Robert Kennedy addressing a crowd from a stage with his wife Ethel moments before Kennedy's assassination, Ambassador Hotel in Los Angeles, June 5, 1968. "I was disturbed that the wrong person might have been convicted of killing my father," Robert F. Kennedy Jr., 64, an environmental attorney and activist, told The Washington Post last month. "My father was the chief law enforcement officer in this country. I think it would have disturbed him if somebody was put in jail for a crime they didn't commit." RFK Jr., who was just 14 when his dad was killed, said he reached the conclusion that a second gunman got away after visiting for three hours late last year with his father's convicted assassin. He is renewing calls to reopen the homicide case, a request he first made in a 2012 letter to U.S. Attorney Eric Holder and presented to the California Department of Corrections Board of Parole in 2016 at convicted killer Sirhan Sirhan's 15th unsuccessful parole hearing. -- Why did forensic scientists studying audio of the shooting hear 13 shots when Sirhan's gun only held eight bullets and he had no time to reload? -- How could Sirhan have killed Kennedy when he was standing in front of him when he fired his weapon, while the autopsy report shows the fatal point-blank shot entered RFK's skull behind his right ear? -- But the biggest question can never be answered. Had he been elected president, could Kennedy have realized his ambition to unite a country divided on many fronts, end poverty and foster race and economic equality? When Robert Kennedy started his campaign, President Lyndon Johnson, who had been his brother's vice president and former Senate Majority Leader, was still expected to seek reelection. But when Johnson stunned the country on March 31, 1968, in a televised announcement that he would not run, Kennedy's quest to succeed him skyrocketed. He won primaries in Indiana, South Dakota, Nebraska and Washington, D.C. By the night of his victory in California, he had become a viable challenger to be his party's nominee. But it was not a sure thing. Sitting Vice President Hubert Humphrey, the favored candidate of the Democratic Party machine, stood in his way as the countdown to the Democratic National Convention in Chicago got underway. 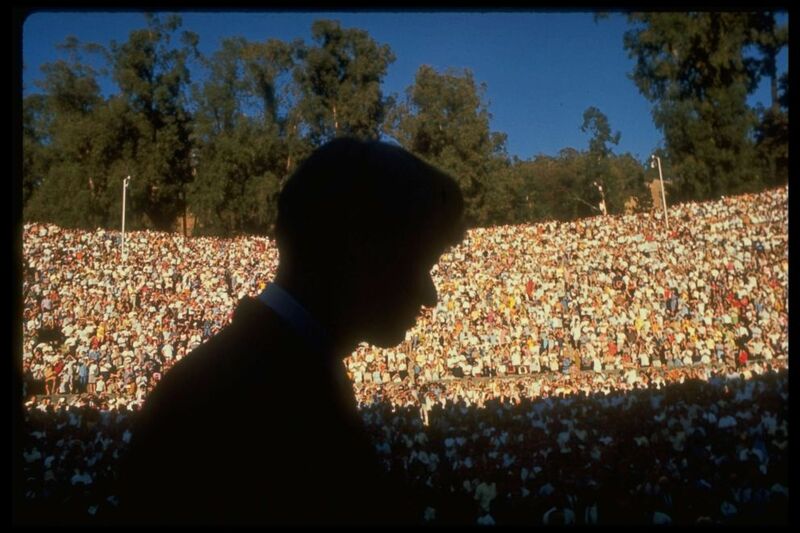 Robert F. Kennedy (silhouetted) speaks at U.C. Berkeley's Greek Theatre on behalf of Gov. Edmund G. Brown, Oct. 1, 1966. "I want to express my high regard to Don Drysdale, who pitched his sixth straight shutout tonight and hope that we have as good fortune in our campaign," a smiling Kennedy said as supporters cheered loudly. The candidate joked that he wanted to "express my gratitude to my dog, Freckles, who has been maligned," he said, referring to the criticism he had received for taking his beloved English springer spaniel on the campaign trail with him. "As Franklin Roosevelt said, 'I don't care what they say about me, but when they start to attack my dog...'"
Later in the speech, Kennedy -- who had become a critic of the Vietnam War, a conflict he admitted helping prolong as his brother's most trusted White House adviser, and had made combating poverty and racial inequality cornerstones of his campaign -- turned serious. "What I think is quite clear is that we can work together in the last analysis and that what has been going on in the United States over the last three years, the divisions, the violence, the disenchantment with our society, the divisions whether it's between blacks and whites, between the poor and the more affluent, or between age groups or on the war in Vietnam, that we can start to work together," Kennedy said. "We are a great country, an unselfish country, a compassionate country. And I intend to make that my basis for running," he said. "So, my thanks to all of you, and now it's on to Chicago and let's win there." The time was 12:15 a.m. when Kennedy left the stage to euphoric cheers and more chants of "Kennedy! Kennedy! Kennedy!" and "RFK!" RFK, according to the Los Angeles County Medical Examiner's autopsy report, was hit three times. One bullet grazed his forehead, another penetrated his neck, and the third entered behind the right ear and smashed through his skull. The path of the fatal bullet, according to the autopsy report, traveled through the "skin of [the] right mastoid region" and continued through the "right mastoid, petrous portion of right temporal bone, right temporal lobe, right cerebellum, and brain stem." 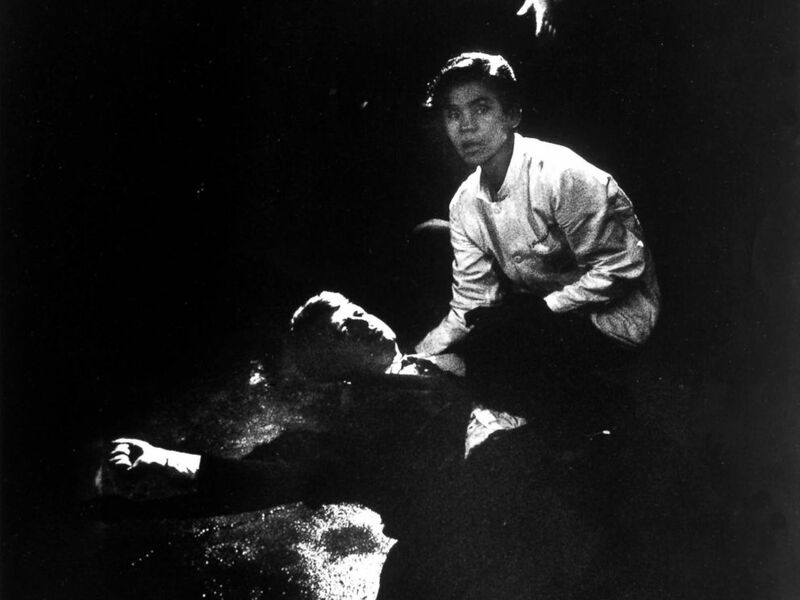 Sen. Robert Kennedy sprawled semi-conscious in his own blood after being shot in brain and neck while busboy Juan Romero tries to comfort him, in kitchen at hotel, June 5, 1968. "The suspect came from his right side, walked up and apparently reached over several people and fired several shots at the senator, where the senator was hit," Sgt. J.R. McArthur of the Los Angeles Police Department told ABC News at the time. 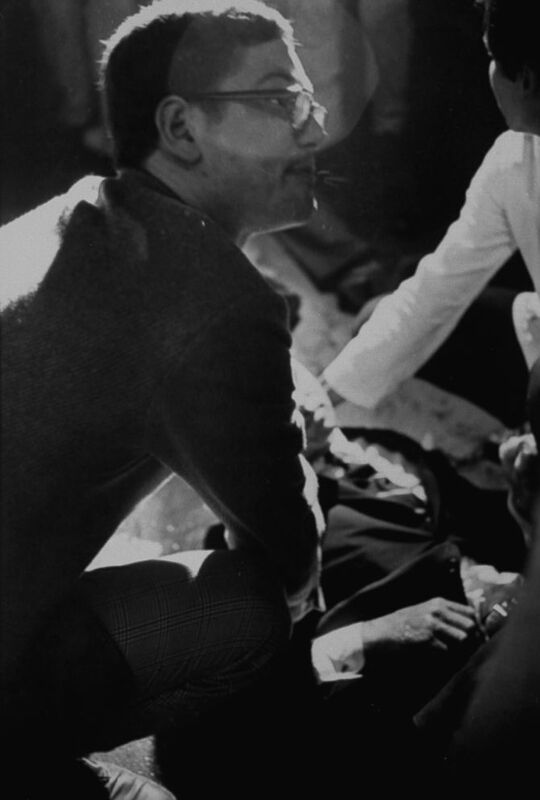 An iconic picture taken by photojournalist Bill Eppridge for Life magazine captured Juan Romero kneeling and cradling Kennedy's bleeding head against his white busboy coat. News of the shooting quickly spread, transforming the chandeliered ballroom where the large boisterous crowd was still celebrating into a room of horror and tears. Screams of "No!" and "Why?" echoed through the venue. Kennedy's aides returned to the microphones that the hopeful candidate had used to now ask for doctors to come backstage immediately and try to save his life. "I speak to you this evening not as your president, but as a fellow American that's shocked and dismayed as you are by the attempt on Sen. Kennedy's life," Johnson said from the White House. "Deeply disturbed, as I know you are, by lawlessness and violence in our country of which this tragedy is the latest spectacular example." RFK's body was flown to New York, where a funeral Mass was held on June 8 at St. Patrick's Cathedral. "My brother need not be idealized or enlarged in death beyond what he was in life; to be remembered simply as a good and decent man who saw wrong and tried to right it, saw suffering and tried to heal it, saw war and tried to stop it," Ted Kennedy said in the eulogy to his second brother slain in less than five years. His casket was placed aboard a special funeral train at Manhattan's Penn Station and with 1,000 relatives, friends and campaign workers set off to Union Station in Washington, D.C., a 225-mile trip delayed numerous times by tens of thousands of people lining the tracks to get a glimpse and pay respects to the now-martyred people's champion. Kennedy, who had enlisted in the U.S. Navy during World War II and served from 1944 to 1946, was buried 50 feet southwest of JFK's grave at Arlington National Cemetery. Sirhan Sirhan's trial in Los Angeles Superior Court began on Feb. 12, 1969, after Judge Herbert V. Walker rejected his offer to plead guilty to all charges and face execution. Robert F. Kennedy being comforted by an aide, after being fatally wounded at the Ambassador Hotel, June 5, 1968. 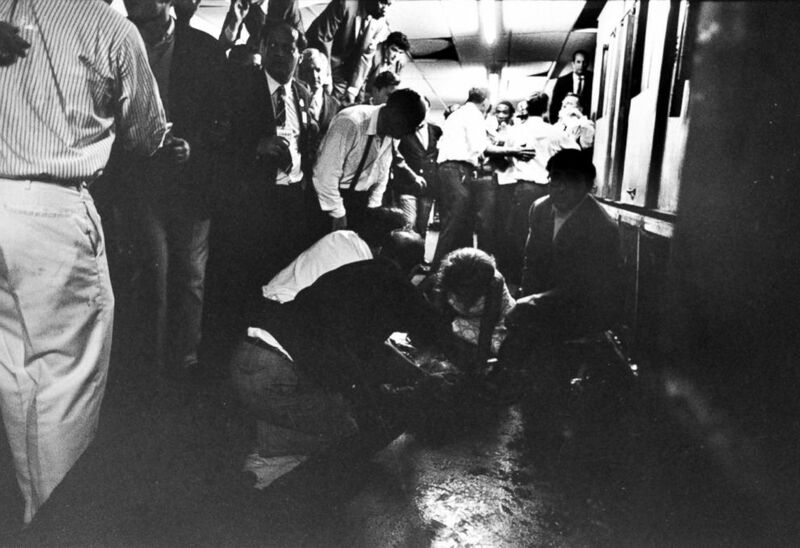 In his opening argument, prosecutor David Fitts said Sirhan had practiced at a gun range the day before Kennedy's assassination, that he had cased out the Ambassador Hotel in advance of the shooting, and told his garbage collector a year before the murder that he intended to kill RFK. On March 3, 1969, Sirhan was called to testify at his trial and admitted he shot Kennedy "with 20 years of malice aforethought." When his defense attorney Grant Cooper asked him why, the defendant went on a rant about the "Middle East conflict between Arab and Jew." A psychiatrist called by the defense said Sirhan suffered from diminished mental capacity at the time of Kennedy's murder, but the jury rejected his diagnosis. In a 1989 televised interview British broadcaster David Frost conducted for "Inside Edition" at the maximum-security state prison in Soledad, California, Sirhan said he felt betrayed by Kennedy's support of Israel in the 1967 Arab-Israeli war. "My only connection with Robert Kennedy was his sole support of Israel and his deliberate attempt to send those 50 bombers to Israel to obviously do harm to the Palestinians," he told Frost, referring to a speech RFK gave in support of United States supplying fighter jets to Israel. "I was not doing it out of personal malice toward the man, but out of concern for other people," Sirhan, who had immigrated to the United States with his family as a boy, said of why he killed Kennedy. "I can't say anything except that I am totally sorry and feel nothing but remorse for having caused that tragic death," he said. In 2011, Sirhan's new lawyer, William F. Pepper, filed an appeal asking for a retrial based on newly discovered evidence. Pepper argued that sophisticated tests done on an audio recording of the shooting made by freelance newspaper journalist Stanislaw Pruszynski detected 13 gunshots fired in the attack. "There is no question he was hypno-programmed," Pepper told ABC News at the time. "He was set up. He was used. He was manipulated." Robert F. Kennedy's wife Ethel tries to comfort him after he was mortally wounded on June 5, 1968 at the Ambassador Hotel in California. But that same year, an unlikely witness came forward to speak at Sirhan's 15th parole hearing and asked for a new investigation. "I am here to speak for myself, a shooting victim, and to bear witness for my friend, Bob Kennedy," Paul Schrade, then 91, told the parole board, according to a transcript of the hearing. Schrade, who had been shot in the head during the attack, had testified at Sirhan's 1969 trial, pointing the defendant out as the man who committed the shooting. "Kennedy was a man of justice. But, so far, justice has not been served in this case," Schrade told the parole board. "And I feel obliged as both a shooting victim and as an American to speak out about this -- and to honor the memory of the greatest American I've ever known, Robert Francis Kennedy." He continued, speaking directly to Sirhan: "The evidence clearly shows you were not the gunman who shot Robert Kennedy. There is clear evidence of a second gunman in that kitchen pantry who shot Robert Kennedy. One of the bullets -- the fatal bullet -- struck Bob in the back of the head. Two bullets struck Bob literally in his back. A fourth bullet struck the back of his coat's upper right seam and passed harmlessly through his coat. I believe all four of those bullets were fired from a second gunman standing behind Bob. You were never behind Bob, nor was Bob's back ever exposed to you." He then forgave Sirhan for shooting him, and even apologized, saying, "I should have been here long ago." "Sirhan, I’m so sorry this is happening to you," Schrade said as he requested the board to grant parole. "This crime impacted the nation, and I daresay it impacted the world," Parole Board Commissioner Brian Roberts said at the time. "It was a political assassination of a viable Democratic presidential candidate." Robert Kennedy Jr. is picking up where he left off in 2012 -- calling for investigators to reopen the homicide case. It was his letter Schrade read to the parole board. "Paul and his team ... strongly believe this new evidence is conclusive and requires a new investigation," the letter read. "I agree and support his request for a new investigation." The push for a new look at the case has split parts of the family, however. Even though Kathleen Kennedy Townsend agrees with RFK Jr., two other siblings -- Joseph Kennedy II and Kerry Kennedy -- are opposed to opening up fresh wounds, according to the Boston Globe, and would rather people focus on their father's legacy. "As we approach the 50th anniversary of my father's passing, I think what is most important is that our country and my family reflect on what my father stood for and fought for -- a legacy promoting global peace, social justice, and civil rights," she told the newspaper in a statement. Their mom, Ethel Kennedy, "will not comment" on the calls for a new probe, the Globe, quoting Kerry Kennedy, reported. On Tuesday, Ethel Kennedy and other members of her family will gather for a ceremony in what is now called the Kennedy Caucus Room at the Capitol Building in Washington, D.C., to reflect on RFK's legacy and honor four youth-activist groups with the Robert F. Kennedy Human Rights Award. Among the groups honored will be students from Marjory Stoneman Douglas High School in Parkland, Florida, who organized the March for Our Lives rally in Washington in the aftermath of a mass shooting at their school that left 17 people dead. On Wednesday, RFK's family will mark the 50th anniversary of his death by gathering at his gravesite at Arlington National Cemetery for a private service. At 10 a.m. Wednesday, former President Bill Clinton is expected to join the Kennedy family for a public service at the cemetery's Memorial Amphitheater. Still, Schrade was optimistic that Kennedy Jr.'s support could help breathe new life into the 50-year-old case. "The fact that Robert Kennedy Jr. would say, 'Sirhan did not kill my father,'" he said, according to the Globe, "I think that's very effective."